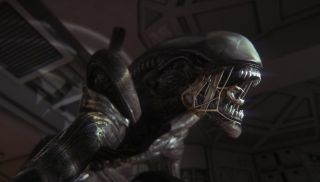 Speaking as someone who lasted about 10 minutes in Alien: Isolation before noping the hell out of there, Obsidian’s cancelled Aliens: Crucible game sounds like it would have been horrifying in all the right ways. Chris Avellone, writer of the game, told VG247 that it would have been like “basically Mass Effect but more terrifying”. While he doesn’t go into a lot of detail about what specific elements of Mass Effect it would have been similar to, and whether it would have had RPG elements, Avellone does say that “it was shaping up to be a really cool game”. One that will now never see the light of day. Damn. It’s a shame that the game is no more, as the premise was strong. It would have started with you “entering the atmosphere, [and you realise] that this planet is incredibly unstable, so your entire crew gets blasted all over the planet”, says Avellone. You would have landed on the planet, obviously, and been accompanied by marines, your squad, and some scientists. If that sounds a bit familiar to you, it probably is, as Avellone acknowledges that Prometheus had a very similar vibe. “The weird thing is that when Prometheus came out”, he says, “I saw some of the similarities, [and thought] ‘oh, we had a character like that’. But [in the game] the entire world was more violent and there were a lot more Aliens running around. It was more a question of survival, and ‘how do we recover all the supplies, and desperately try to make a base?’ It was fun to set up”. It sounds like it, but we’ll have to take Avellone’s word for it as there’s no chance of us playing it for ourselves now. Well, of you playing it for yourself at least. For those of you who love horror games, here’s the best horror games you can play right now, or look below to see what’s happening this week in the world of games, TV, and movies!